DELAWARE, Oh. 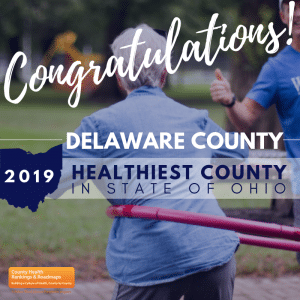 – The Delaware General Health District is pleased to announce that Delaware County is the healthiest county in Ohio for the fifth year in a row. The 2019 County Health Rankings issued today places Delaware County as first in Ohio for both health outcomes and health factors. Health outcomes focus on how healthy people are presently and health factors are based on how healthy people will be in the future. The rankings, presented by the Robert Wood Johnson Foundation and the University of Wisconsin Population Health Institute, are available online at countyhealthrankings.org.